*** NOTE: There will be an OPTIONAL pre-seminar WORKSHOP on Friday, November 3, from 2-5:30 pm (3 contact hours) for an additional $99*, with Karen Ashforth, MS, OTR, CHT, CLT-LANA: "Fibrosis Treatment: Reduce Pain & Lymphedema, Improve Function"
Call for Reservations and ask for the discounted Lymph Seminar rate of only $129/night! This hotel is 7.5 miles from the John Wayne Airport (SNA). 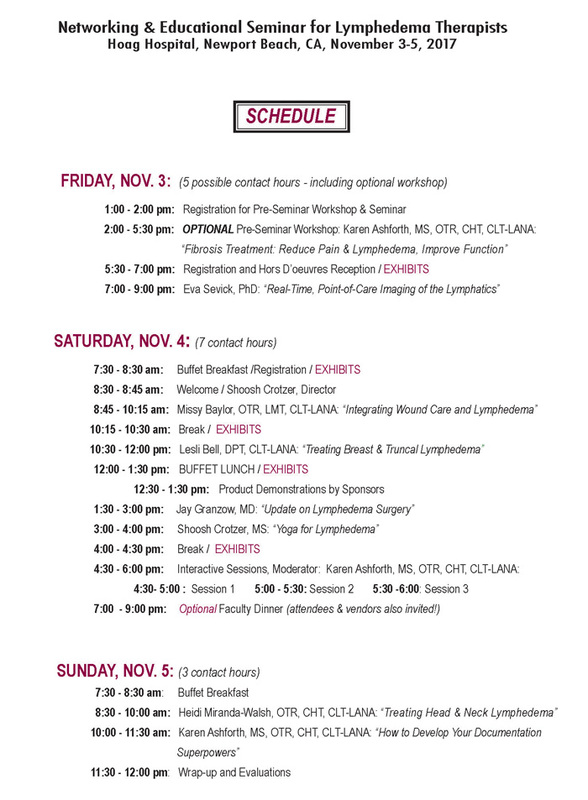 Karen Ashforth, MS, OTR, CHT, CLT-LANA: "Fibrosis Treatment: Reduce Pain & Lymphedema, Improve Function" and "How to Develop Your Documentation Superpowers"
Missy Baylor, OTR, LMT, CLT-LANA: "Integrating Wound Care and Lymphedema"
Jay Granzow, MD: "Update on Lymphedema Surgery"
Heidi Miranda-Walsh, OTR, CHT, CLT-LANA: "Treating Head & Neck Lymphedema"
Lymphedema Seminars is an Approved Provider #8208 for Continuing Education by the American Occupational Therapy Association (AOTA). We also have approval for CEUs for PTs in California CPTA#: 17-289.